Have you ever caught yourself comparing yourself to other people before? I know I have. I used to be the world’s worst at comparing myself to other people. I was constantly looking at others, then looking back at myself–and finding that I didn’t measure up. I didn’t have any connections. I wasn’t popular in high school. I didn’t come from a rich family. I had plenty of entrepreneurial ideas, but most of the things I tried never worked out … unlike those people, for whom every business they touched turned to gold. I didn’t really have favor that followed my life. People didn’t walk around giving me cars, money, ministries, promotions, or anything else. I felt like I didn’t have much at all. Not much to give. Not much net worth. Not much personal impact. Nothing that would make me very special. who were constantly surrounded by friends–and were always together with people they loved when they went to the movies, went on vacation, went out to eat, and hey, probably even when they went to the bathroom. At least, that’s how the other people looked to me. Needless to say, I didn’t measure up. I knew that comparing myself to other people was a big problem in my heart, but I didn’t know how to fix it. I mean, after all, I was looking at reality. I didn’t have the money, connections, social life, fancy hair, or perfect physique. So how was I to overcome reality? Over time, Holy Spirit showed me how to stop comparing myself to other people. And I want to share 6 things with you today that He showed me. 🙂 Are you ready? 1. Holy Spirit gives each of us special gifts–one in one way, and another in another way. Having then gifts differing according to the grace that is given to us, let us use them: if prophecy, let us prophesy in proportion to our faith; or ministry, let us use it in our ministering; he who teaches, in teaching; he who exhorts, in exhortation; he who gives, with liberality; he who leads, with diligence; he who shows mercy, with cheerfulness” (Romans 12:3-8). The word “soberly” in that passage doesn’t mean to think negatively. It means to think realistically. In other words, if you have a gift, you’re supposed to KNOW you have a gift and ADMIT that you have a gift! Also, notice that the Scripture above says that we all have a different function … meaning, we all HAVE a function. If you think you have no gift, you’re wrong. Scripture says otherwise; so get to finding out what it is! 2. It’s hurtful and insulting to the Lord when we look at other people’s gifts and don’t value the gifts He has given US. Have you ever given someone the most precious gift, and had them not value it at all? Remember how much that hurt? Well, that’s what we do to the Lord when we don’t honor and value the gifts He has given us. The gifts God has given you are special. He thought about those gifts a long time–from eternity past, in fact! He knew exactly who you would be and what He wanted you to be good at, and He knew precisely where He wanted you to fit into His Body. And you know what? He NEEDS you there. He needs you to be where He called you. He needs you to be fully operational in your gifts. Only YOU can fill your role! Only YOU can be who He made you to be, and impact the world the way He has called you to! There are people that only YOU can reach, because only you have your unique combination of gifts, talents, and–most importantly–TESTIMONY! Only you can fill your place. Furthermore, your gifts and calling are God’s special gift to you. And when you turn your nose up at them, or throw them in the dirt, or look at them and curl your lip up in rejection, IT HURTS our Papa. Yes, the Lord has feelings just like you do. He had them first; you were made in His image! And He loves you very much and put all His heart into preparing your gifts. That’s why it hurts Him when we don’t value them like we should. 3. Wanting someone else’s gifts, or wishing we were like them, is envy and jealousy … which are sins. Yeah. Envy and jealousy … definitely on the sin list. Repent therefore, and be converted, that your sins may be blotted out. Thank You, Lord Jesus, for Your blood. 4. Comparing ourselves to other people is, at its root, a lack of self-esteem, self-love, and self-knowledge. When we know who we are–who God made us to be–and love ourselves the way God desires us to, we become free to run in our own lane. We are happy for others who are also being who God made them to be, but we aren’t jealous, envious, intimidated, or diminished beside them. Instead, when we love ourselves and know ourselves in a godly way, we look at others as teammates. Companions. Co-laborers in the Gospel of Christ. We are able to operate in our gift and they in theirs, and we are just as proud of them as we are of ourselves for doing so. 5. Lack of self-esteem, self-love, and self-knowledge are father issues. It’s a father’s job to teach a child who they are; to teach them their value; and to help them get to know themselves and who God made them to be. I spent years working through and healing from father-figure issues. As I did, the Lord taught me who I was and who He made me to be. As Holy Spirit ministered to me and healed me of father issues, I began to love and appreciate myself in a healthy, godly way. I began to value the gifts and calling God had given me, rather than just comparing myself to others all the time. Related: I recently taught a two-hour class and ministry time about healing from father issues (wounds inflicted by father figures in your life). If you would like a copy of that video and the materials from the class, they are available right now by special request. The class fee is $20, and you can email me to request the class and I can send you the materials by email. 6. Comparing oneself to others is often a symptom of not walking fully in your own calling. If I’m busy walking in my own calling, I will see and sense the intrinsic value of that calling. I’ll be surrounded with the good fruit of walking in my own calling every day. Therefore, I won’t be concerned with what other people do or with who they are. I will be free to celebrate them and their results, because I am being me and getting my own results. However, before I started walking in my own calling, I cared only about other people because I wasn’t seeing fruit of my calling in my own life. I wasn’t experiencing the joy and fulfillment of being who I was born to be, on steroids! Dear brothers and sisters, there is HUGE fulfillment in walking in your calling! If you aren’t yet walking in your calling, and you begin to do so, you will find so much joy! So much fruit! So much excitement, hope, and expectation! Your calling is the specialness that God ordained for you! So I learned that comparing myself to others was a healing issue. I had to heal in my relationship with God, learning to relate to Him better and love His thoughts, His heart, and His will for me. I had to heal from numerous father-figure issues: hurts and wounds inflicted upon me by people in positions of fathering and authority in my life. And I had to heal in learning to be myself–no matter what other people thought about me or my call. I had to actually begin walking in my call. And when I healed from those things and began walking in my call, I no longer compared myself to others. It was freeing. It was joyful. It was liberating, and it was the best thing for my relationships, my peace of mind, and my life in general that I could imagine. Do you struggle with comparing yourself to others too? If so, go to the Lord about the 6 issues listed above. Seek His Word and His heart for these things in your life. He will heal you and help you, teaching you your own value–and you’ll never be the same. 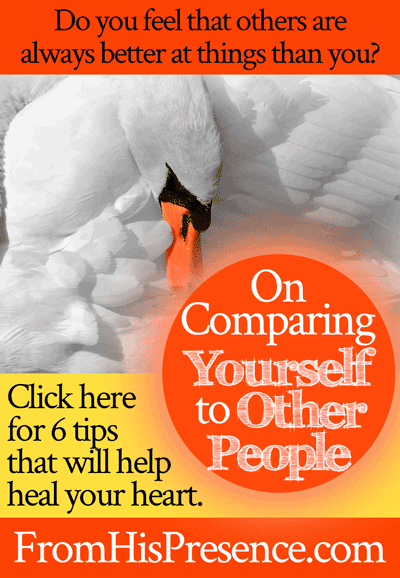 Have you been struggling with comparing yourself to other people? Does this word speak to your heart? If so, please leave a comment below! I’d love to hear from you! When I did that God reminded that I was in Christ, not a competition. 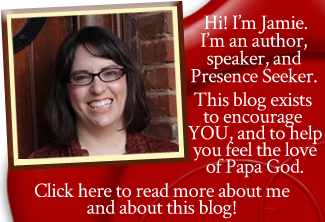 Early on I had a lady with a snazzy blog be snippy about angels bringing blessings. She said only God could give blessings and I told her I was not arguing that point but that angels were a blessing. I was a baby blogger and pinner. Now, I now I don’t have to comment on everything, defend anyone or myself. I have to be me. How do you figure out your calling when you really aren’t sure? Life was about survival growing up in my house so I went through life without a lot of passions or skills, and not much relational experience. The past few years have been a time of learning and healing. I’m now at a point where I desire to contribute to the Kingdom, live with a purpose. But I’m having a hard time figuring out where I fit because of (I feel) my life has been lived in most part in deficit. Deficit of passions, skills, relationships, etc. I don’t know where I fit in the Body of Christ but I greatly desire. hello Anonymous, I too, lived in constant survival mode, without any encouragement or direction. I have no “special” earthly talent or skills but I do feel Father God has great purpose for me, just not sure what it is!! Being in a great spirit filled church and having a group of trusted people to talk and pray with is essential. I seek Him daily, surrender my heart daily and keep pursuing..He is faithful and will guide us and direct us. I have faith to believe our best days are here, for me…and you!! Thank you for the encouragement Karen ❤️. It is helpful to know that others of a similar background share the same struggle. That is exactly how I feel- Father God has a great purpose for me, just not sure what/where/how. I will keep seeking, surrendering, and pursuing. We have been in search of a good spirit filled church. They are hard to find in our area. It’s so frustrating! I want to go to a church that’s alive!! Thank you for the advice friend. God Bless you!!! I can relate so much to what you have written above Jamie! Thank you so much for sending me this reading. Today l failed my philosophy assognment & got 54%, whilst those l did discussions with passed with 84%. I was so hurt & l asked God why me, why did l fail. I failed to see other blessings that God gave me at that moment. But now lm ok, lm content with my mark & l must never compare myself with others. God gives us blessings differently. Thank you, be blessed.